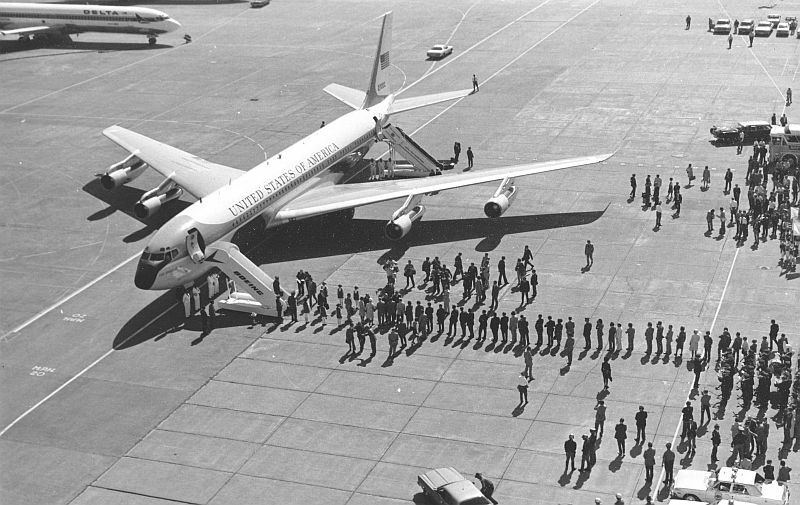 Everyone's gathered again at Seattle's Boeing Field on October 25, 1976 as President Gerald Ford wings his way in on "The Spirit of '76" a/k/a Air Force One, for a late campaign visit. Jack Gordon again performed duties as the Chairman of this visit. According to the President Ford Library and Museum, Seattle had a busy morning planned for the President. Arriving here at about 10:45 a.m., he had a civic welcome at Boeing Field, went to Todd Shipyards, had a hydrofoil ride to Pier 57, went to the Veterans Hospital, held a campaign appearance, and left Seattle at 2:15 for Portland. Whew! Somewhere along the line he also had time to have his picture taken with Chairman Jack Gordon and Washington Governor Evans.